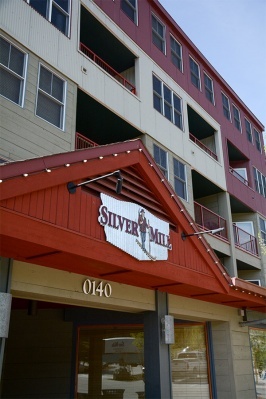 Silver Mill Condos are conveniently located right at River Run Plaza, and easy walk for you or your guests from the main parking lot at Keystone's River Run base area. All the shops and restaurants of River Run are steps away, and the gondola to the top of Keystone Moutain is at the end of the plaza. River Run is the newest of Keystone's neighborhoods, and the architecture was designed to be a little bit retro - Retro 1880s Colorado mining era. This building is efficiently constructed, and everything is relatively new, but it has the exterior charm of that bygone era. All the conveniences of the best resorts are right at River Run for all the homeowners of any of the River Run condo buildings, like Silver Mill. These amenities includes fitness rooms, hot tubs, a clubhouse, swimming pool, and ski storage.